The infamous Artists and Repertoire Club. Description: Circus impresario Billy Smart and Soho legend Paul Raymond were often found here in the Artistes & Repertoire Club (also called the 'A & R'. Paul Raymonds biography calls it It was a disreputable yet atypically light and airy ground -floor club, the walls of which were papered with signed photos of famous musicians. It didn't just attract music industry legends but also actors, sportsmen and criminals. The piano was always available for those with new tunes to try out. Former Eastenders actor Jamie Foreman tells of his younger days here in his autobiography The A & R was a regular haunt, and not just Mondays and Thursdays either. Dad and I often dropped by after his morning meets. 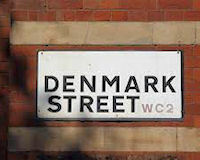 We'd park up behind Charing Cross Road, walk up Denmark Street or Tin Pan Alley and up into Ronnie and Mick's place. You were bang in the centre of London, but once you entered the A & R you were shut off from everything and in another world. All the shoplifters used to come in offering whatever they'd nicked that morning, and more often than not I'd end up buying something nice for myself, Mum or whatever girl I was seeing at the time. Shoplifters were brilliant in those days you never had to buy anything over the counter, as they had it all covered: cashmere jackets, suits, fine shoes, handbags, jewellery. They were like Savile Row tailors once they knew your size they never forgot. You'd be having a drink and one of them would approach you. 'You're a 42 short, aren't you, Jamie? I've got a lovely Aquascutum two-piece suit. Look lovely on you. Three hundred, but I'll take a oner for it.' If you wanted something, chances were you'd find it at the A & R.
Angelo Bruno of the Philadelphia mafia. In football legend Malcolm Allison's biography Big Mal, it describes him borrowing 2000 from the QPR chairman Jim Gregory to buy the A & R Club, leading to many leading players heading here after games on a Saturday.